Remove the lid from your tin of pineapple. Pour the juice into a cup. Make it up to 3/4 of liquid with some water. Pour it into a saucepan and heat on the stove until it’s hot enough to add the gelatine. Add the gelatine and stir until it’s dissolved. Pour it into the can. 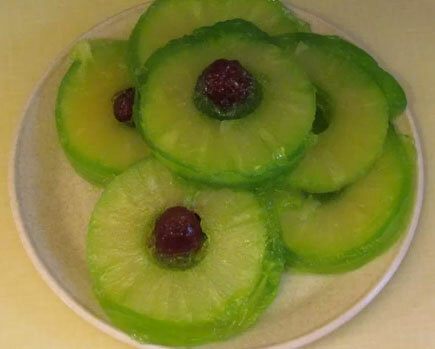 Put some glace cherries down the centre of the pineapple rings. Set in the frigde overnight. Put a plate over the top of the can and flip it upside down. To remove, cut the bottom off the can and gently push the pineapple roll out.